Discontinued - In case of need, contact us through the online form on the left side bottom of this page. We are sorry, but this product has been discontinued! For a replacement, we recommend our SAE J1939 ECU Simulator Board With USB Port. Refer to section "For Use Under Raspberry Pi And Linux" for more information. 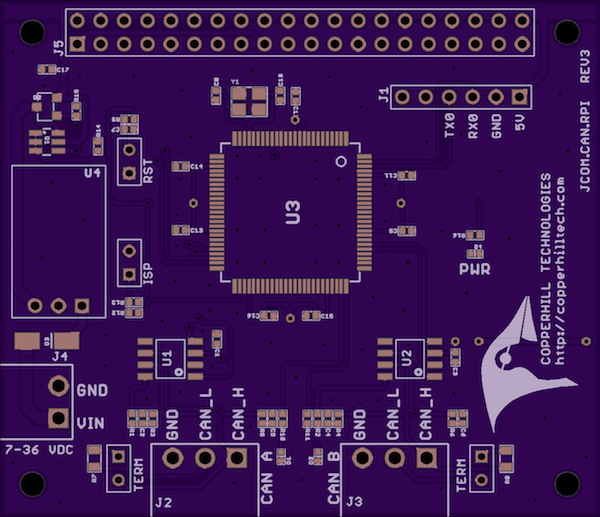 The firmware of this board is identical to the SAE J1939 Turbo Interface for Raspberry Pi, however, with a different form factor and use of the USB port (rather than the onboard COM0 port). The jCOM.J1939.RPi, an SAE J1939 interface for the Raspberry Pi, is not an RPi HAT in the common sense. The board incorporates an ARM Cortex-M3 processor with CAN transceiver for use on the Raspberry Pi while allowing the operation with any other RPi-compatible board. By combining our J1939 port interface, the Raspberry Pi, an SAE J1939 cable, and open-source software libraries, you are ready to go with a powerful turn-key RPi-based J1939 bus solution. Leverage the vast processing capability of the Raspberry Pi plus the built-in CAN port for your next prototype. In order to more efficiently serve automotive applications, the jCOM.J1939.RPi board supports an optional extended input power range of 7 to 36 VDC to power the entire system, i.e. including the RPi itself. What is the "Turbo" Aspect? The jCOM.J1939.RPi integrates an 100 MHz ARM Cortex-M3 with a CAN transceiver and a fast serial connection to the Raspberry Pi. The processor, acting as an SAE J1939 gateway, receives and processes all J1939 data frames, including filtering of PGNs, thus reducing the processing burden on the RPi CPU. The processor also manages all timing requirements according to the SAE J1939 standards, which eliminates any impact on protocol performance due to high RPi CPU loads. The processed data delivered to the application includes the PGN, data, and priority. Any data length, either the standard 8 bytes or up to 1785 bytes (TP = Transport Protocol) are supported, freeing the application engineer from managing tedious protocol features. The jCOM.J1939.RPi allows the Raspberry Pi to run your J1939 application comfortably even at high bus load, without slowing down your application responses. All this is supported by an extensive programming library (in C source code) and sample code. The SAE J1939 Turbo Interface for Raspberry Pi (jCOM.J1939.RPi) uses the RPI's serial port for the communication between the two processors. The CAN Bus interface translates received J1939 data frames into a serial string and sends it to the RPi's CPU for further processing. In turn, the RPi sends serial data to the jCOM board where it is being translated into a J1939 data frame. The protocol used for the data exchange is described in our jCOM.J1939 Serial Communication Protocol. Go to Interfacing Options/Serial and set No at “Would you like a login shell to be accessible over serial?” Then set Yes to "Would you like the serial port hardware to be enabled? ", validate and reboot, that's all. Go to Advanced Options/Serial and set No at “Would you like a login shell to be accessible over serial?”, validate and reboot. Also, check the /boot/config.txt file for the line enable_uart=0, and if it exists change it to enable_uart=1 and reboot with sudo reboot. All this will work smoothly with the Raspberry Pi 3 V1.2 and newer. For any older version, the setup procedure will be a bit more complex. Exploring Raspberry Pi is an innovators guide to bringing your Raspberry Pi to life. The book favors engineering principles over a 'recipe' approach to give you the skills you need to design and build your own projects. You will understand the fundamental principles in a way that transfers to any type of electronics, electronic modules, or external peripherals, using a "learning by doing" approach that caters to both beginners and experts. The book begins with basic Linux and programming skills, and helps you stock your inventory with common parts and supplies. Next, you will learn how to make parts work together to achieve the goals of your project, no matter what type of components you use. The companion website provides a full repository that structures all of the code and scripts, along with links to video tutorials and supplementary content that takes you deeper into your project. The Raspberry Pi's most famous feature is its adaptability. It can be used for thousands of electronic applications, and using the Linux OS expands the functionality even more. 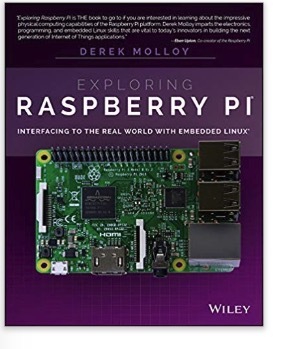 This book helps you get the most from your Raspberry Pi, but it also gives you the fundamental engineering skills you need to incorporate any electronics into any project. Build your inventory of parts so you can always "make it work"
Click the button below to add the SAE J1939 Turbo Interface for Raspberry Pi to your wish list.